A slob cod like this monster caught south of Fire Island Inlet can eat some pretty unusual items including tube worms, rocks and sea anemones. Read on to find out what man-made delicacies have been found in the bellies of baccala. Photo courtesy of Capt. Neil Delanoy, Laura Lee, Captree, NY. For as long as anyone I know can remember, skimmer clam has been the standard codfish bait here on Long Island. In fact, I can’t ever recall setting out for baccala without a bag or two of skimmers on board even when diamond jigging was expected to be the primary technique for the day ahead. Be that as it may, it’s a known fact that cod will eat more than shucked mollusks for supper. In fact, it is a pretty fair bet that clams aren’t even a staple on the codfish’s regular diet. Truth be told, skimmers are used more because they are convenient to anglers than because they appeal to Mr. Whiskers. It was back when the earth’s crust was just starting to cool that I cornered Capt. Billy Urvalek, then skipper of the Montauk charter boat, Karen Sue, and asked if he’d ever found unusual dinner items in the stomach of a cod. Indeed, Urvalek revealed, he had seen cod spit up whole squid, rocks, various crabs (especially red rock crabs on Georges Banks,) sand eels, flounder, mackerel and herring. Once he even pulled a winter glove from a codfish’s mouth! Captain Richie Kessinger, also long retired but once skipper of the Freeport open boat Starstream II which now sails proudly for the Capt. Lou Fleet, also found “all sorts of stuff” inside local codfish. Among some of the more interesting items he noted were chicken bones, carrots and plastic bags. According to Kessinger, anglers “in the way back” often used tomatoes, lettuce and even chicken combs (the fleshy red top from a rooster’s head) to catch codfish. Apparently, this all came about because the West End party boat fleet used to fish close to the area where New York City dumped its garbage, “a bit southwest of Ambrose.” Back then, untreated garbage was simply dropped into the ocean and the cod, ling and hake picked out what they considered edible! Thankfully, things have changed over the years. No longer is raw garbage dumped (legally) at these sites. As for more recent findings, Kessinger cited rocks, tubular worms, herring and bergalls as his primary discoveries. Other anglers have discovered jewelry, a man’s wallet, rare and exotic seashells, lobsters and even a set of false teeth! 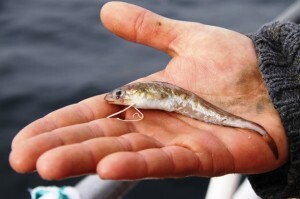 A codfish coughed-up this baby ling, still barely alive, aboard the open boat Celtic Quest. It’s said dogfish have no predators, but this newborn wiggled free of a cod on a long range Viking Star wreck trip. 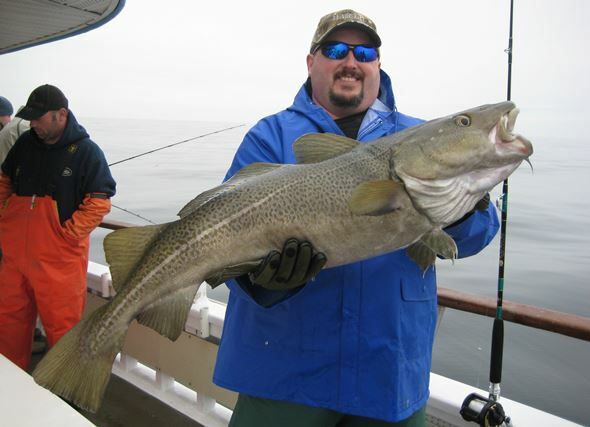 Even more interesting, Potts caught a pair of 20-pound cod while fishing the Gateway area south of Block Island in early April a few years back. Both fish, he reported, had 1-pound stripers in their bellies. While I doubt dentures, chicken combs or baby stripers will ever replace skimmer clam as the standard codfish bait, the findings above do illustrate one main point – the winter king is quite adaptable when it comes to feeding time and anglers can use this to their advantage. I’m a firm believer in giving the fish a choice of baits on those days when the action takes on a “picky” feel. Thus, when the skimmer finds few takers, I’m usually one of the first to begin experimenting – and I have stumbled across several types of offbeat baits that work rather well. My first “go to” bait for cod is “conch.” This term is used to loosely describe virtually any large sea snail or whelk that turns up in the bait bucket along with the day’s cargo of skimmer. Crack open the tough shell and you’ll find a leather-like tube of flesh that can be sliced lengthwise into two long pieces. Cut off the hard-skinned “foot” and carve each slice so that it is one-half-inch thick. Impale the conch or snail strip on the hook just as you would a piece of skimmer clam. Because conch and snail are very tough, make certain the hook point and barb protrude fully through the bait. Leave a trail end of at least two inches hanging down from the hook’s bend and, if you like, add a stringy ribbon of skimmer to top it all off. If you know a clammer or bayman, work out an arrangement to get a few conch before heading out. It’s worth the effort. Conch-type baits shine brightest when dogfish and bergalls are plentiful. Because the meat is so tough, it stays on the hook longer than would a piece of clam, giving big, lethargic cod a little extra time to consider trying a taste. 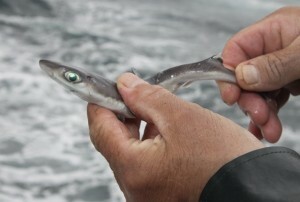 Small bergalls also seem to simply shy away from this bait, probably because it is so tough to chew and tear. I’ve actually had days when I’ve managed three or four cod on one strip of conch, a feat unheard of among the clam bait crowd. 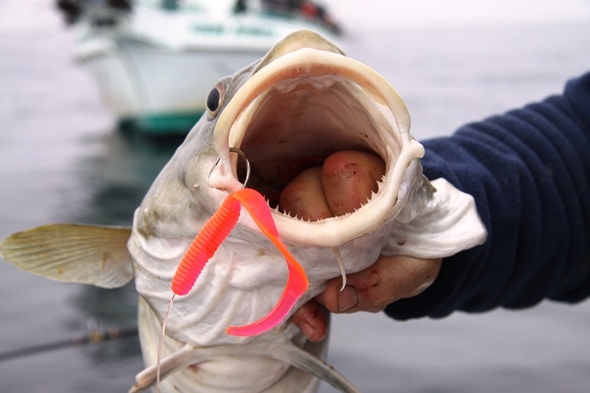 With a huge mouth that sports small but sufficient teeth, cod can chow down on big globs of soft bait or grasp swimming baitfish like herring, mackerel and sand eels. Don’t underestimate their willingness to enjoy a varied diet. On days when the bergalls and dogfish aren’t a significant problem, you might find a whole squid much to the liking of an old soaker codfish. 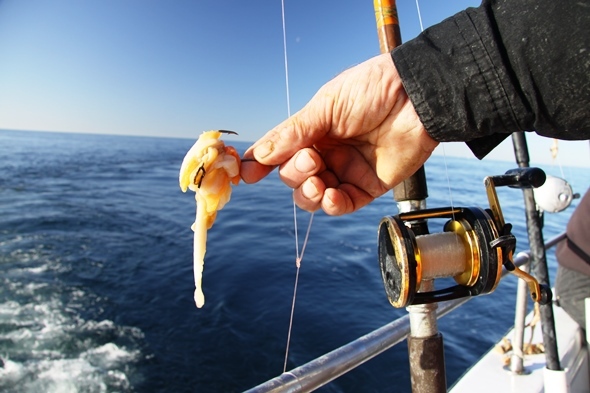 Small local squid work best for this application, with a bait that measures four to six inches along the mantle the premium size. Squid are also a good choice on those days when the cod seem tentative. I envision the tentacles as waving in the current, just begging the nearest fish to come over and sample a taste. Some anglers fish squid on a tandem-hook rig but I like to string one up on a single codfish hook and push the point out the head. By the way, a squid head alone seems to work just as well as an entire squid when you set up on market size cod weighing less than 10 pounds. Many anglers use fish strips for fluke during the heat of summer and these same strips sometimes work on cod. Fresh herring, ling and mackerel fillets are best for this and if you can catch these baits while on the fishing grounds so much the better. Simply fillet one of these oily baitfish, being careful to leave the skin and scales intact, hook the fillet once through the wide end, and lower away. I once nailed a 32-pound cod on a mackerel strip, taking a hefty party boat pool, and I’ve collected several nice pollock with these baits as well. Offbeat baits are worth a try, but skimmer is the old standby. If you are going to use the clams, do it right. Thread a single clam, hooked at least once through the siphon, so that a piece of the stringy outer rim dangles from the hook. 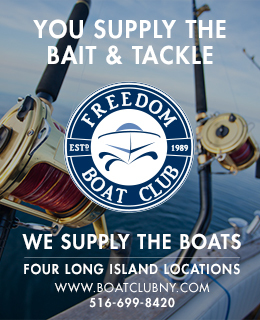 Be sure your barb protrudes all the way through the bait. Want to score a little revenge on those pesky bait-stealing bergalls? Simply rig one up and send it right back down from whence it came. Hooked through the eyes and lowered slowly to the bottom in an attempt to keep the line from twisting, they hold up pretty well and do catch some outlandish fish. A 65-pound soaker my father caught years ago aboard the Montauk-based open boat Viking Star, in fact, had two bergalls in its stomach along with a small, black rock! And what secret off-beat bait did that monster inhale? Nothing more than a single piece of skimmer clam. Outdoor Tom’s Extras, posted 1/26/14.